Each year a court of four young ladies are selected from among the sophomores and juniors in the Battle Ground School District. This court (there is no queen) commit to a full year as ambassadors for the float project, their school and the community at large. In early Spring, applicants from each school are interviewed much as a job interview. Princesses are selected for grades, poise and positive attitude. 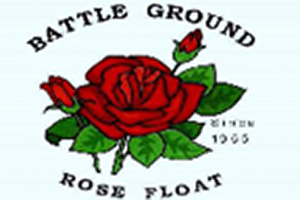 As Princesses they ride Battle Ground’s Float in th Portland Rose Parade and the Harvest Day Parade. They also participate in other local parades in cars. Besides visiting many of the community’s nonprofit clubs, there are several community events in which they participate such as the Kiwanis Easter Egg Hunt, the GFWC Ladybug Bazaar and the North County Community Food Bank during Santa’s visit and tree lighting at the Community Center.